Sakonnet Point is at the southern tip of a peninsula composed of two towns, Tiverton to the north and Little Compton to the south. The Sakonnet River, actually an inlet of the Atlantic Ocean, separates the area from the busier Aquidneck Island to the west. The establishment of a light-house on West Island, which is situated about one-third of a mile to the southward of Sakonnet Point, would render the navigation of that locality much safer. The lower part of Sakonnet River is a good harbor of refuge for coasting vessels, and it would be safe and easy of access were a light shown from West Island. Congress quickly appropriated $20,000 for the lighthouse. A small hotel on West Island had been bought by some wealthy local residents and turned into a fishing club that claimed the best striped bass fishing on the Atlantic coast. Presidents Chester A. Arthur and Grover Cleveland were among the visiting anglers. Some of the club members became friendly with President Arthur, which apparently lent them some political clout. As a result, the Lighthouse Board was forced to steer away from West Island and set their sights instead on Little Cormorant Rock, about 900 feet northwest of the island. The rock was ceded by the state of Rhode Island to the federal government in early 1883. Construction was difficult and slow at the rugged, exposed location. The base, a concrete-filled cast-iron caisson, was completed in 1883, but severe weather late in the season delayed progress. Work continued through most of the following year, and the lighthouse went into operation on November 1, 1884. A revolving fourth-order Fresnel lens produced a white light with intermittent red flashes. The four-story cast-iron tower has a diameter of 22 feet at its base and 12 feet at the fourth level. It is topped by a cylindrical watchroom and a 10-sided cast-iron lantern. The combined height of the caisson and tower is 66 feet, and the light shines from 70 feet above the water. The caisson, 30 feet in diameter, contains a brick-lined basement that held a cistern, coal bin, boiler, and privy (not installed until around 1920). The keepers lived inside the tower, with the first floor serving as a kitchen and living area. The second and third floors were bedrooms, and the fourth level was a combined bedroom and tool storage area. The station always had a principal keeper, an assistant, and in later years also a second assistant. As might be expected at a relatively isolated, waveswept location, turnover was high. More than 50 men served as keepers or assistants before the Coast Guard took over in the early 1940s. John Ganze was an assistant keeper in the late 1920s into the 1930s. Ganze is quoted in Sarah C. Gleason's book, Kindly Lights: A History of the Lighthouses of Southern New England. He described the isolation and bleakness of the off-season: "You could drop dead in the winter and no one would find you till spring." The only heat came from a stove in the kitchen. "They'd give you a cord of wood for the winter," said Ganze, "and when it ran out-that was it!" Ganze also said that birds would often fly right into the lantern. The birds would end up dead in the cistern, where they'd remain until the keepers had a chance to clean it out. William Durfee became the principal keeper in 1921, and he would remain in the position for a remarkable 20 years. A major storm on August 26, 1924 sent waves crashing over the top of the lighthouse, 70 feet above the water, smashing the lower windows and destroying the station's boats. Bad as it was, it wasn't as catastrophic as what Durfee and assistant Joseph O. Bouley would experience during the great hurricane of 1938. Bouley was a U.S. Navy veteran who had previously been stationed at Whale Rock Light and Gull Rock Light, both in Rhode Island. By three o'clock the wind blew a gale and the sea began to go higher and higher. Pounding with such a force that it smashed up all the boats and by four o'clock we had lost part of our rain shed, one oil tank, a boat landing, also smashing in the engine room and flooding the engines and putting the fog signal out of commission. At five o'clock all outside doors had been carried away and all windows from the first floor to the third floor were stove in, so that we were practically flooded out of our home. At five-thirty I went into the tower to light up. While there, we took what was called a tidal wave. There were seas that went by that completely buried the tower. The first sea that came along was the one that caused the most damage. That one broke seven plates out of our upper deck, which is fifty-six feet from the average high water. That sea, when it hit the tower, sounded like a cannon. And it hit with such a force as to knock me off my feet. . . . But when I finished lighting up and started to go downstairs I was some surprised to find that I had to crawl through some broken deck plates that had fallen over the stairs. . . .
At sunrise Mr. Bouley put the light out and called me to see the beach. And we were surprised when we looked to the point and saw that everything had been washed away. Two-thirds of the 75 cottages and shanties that made up the fishing community at Sakonnet Point were destroyed in the hurricane. Catastrophe was averted at the lighthouse, but the damage was significant. A major crack in the caisson was soon repaired and the light remained in operation. 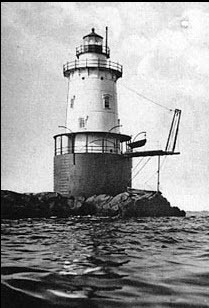 After Hurricane Carol in 1954 caused addtional damage, the Coast Guard elected to decommission and abandon Sakonnet Point Light. Most of the fourth-order lens is now at the Maine Lighthouse Museum in Rockland, ME, while a small section of the lens is in the possession of the Little Compton Historical Society. Carl Haffenreffer, president of Narragansett Brewing, bought the lighthouse for $1,111.11 at auction in 1961. The Haffenreffer family kept the lighthouse painted, hiring bridge painters to do the job, but upkeep was expensive. In 1985, the structure was donated to the Friends of Sakonnet Point Lighthouse, Inc. The group raised funds to restore the lighthouse. Workers and volunteers dug out pigeon guano two feet deep, sandblasted the tower and repainted it, among other repairs. Even as they celebrated, the group's next intention was to have a navigational light returned to the tower. Relighting was scheduled for December 1992, and the lighthouse got a fresh coat of paint in preparation for the big event. The Coast Guard installed a new optic and other equipment, including solar panels for power. But the plans ran into heavy seas when fears arose over liability if an accident resulted from a failure of the light. Due to the perceived threat of lawsuits, the Friends shelved the relighting. It took almost four more years and an act of Congress to solve the liability dilemma. In the fall of 1996, with the help of Senator John H. Chafee, language was included in a Coast Guard appropriations bill that absolved the group from any liability should the light malfunction. More than 40 years after it had gone dark, the way was cleared for the light to be switched back on. Coast Guard personnel from Bristol got the optic and related equipment in order, and on March 22, 1997, the Friends of Sakonnet Lighthouse celebrated in style on nearby Lloyd's Beach. A band played on the beach and hundreds arrived in cars and buses. The new .77 amp bulb produces a red flash every six seconds, visible for seven nautical miles. In January 2006, the Friends of Sakonnet Lighthouse received word that the group's application for $844,323 from the federal Transportation Enhancement Program had been approved. Along with bolt replacement, patching, and painting, there are plans to install better boat landing facilities at the lighthouse. The group has also privately raised close to $200,000 for restoration. The structure is a cast-iron drum with an interior lining of brick. The structure tapers with thick flanged iron sheets engaging masonry. Although this is not truly a structural composite, the iron and brick interlock in such a way that one cannot move without the other moving. Brick growth, natural cement mortar harder than the bricks of the liner, and corrosion jacking on the inner faces and joints of the iron sheets, work together to announce the lighthouse's deterioration as a "paint problem" to passing recreation boaters. The primary problem with corrosion, and the primary consequence of paint failure, occurs at the joints of the panels of the drum, which are bolted but not welded and no longer watertight on the exterior. Structures North decided to tear out the existing brick liner . . . The cast-iron will be shot blasted on both sides then painted with a 3-part paint system (zinc-rich primer, epoxy, and polyurethane top coat). New brick will be brought to the site to replace the ruined liner. In November 2009, it was announced that the restoration of the lighthouse would take place in 2010-11. The contract was awarded in March 2010 to the Joseph Gnazzo Company of Union, Connecticut. Work began in the summer of 2010. As part of the project, all the rust was hydroblasted off the tower's iron plates. All the rusted cast-iron bolts were replaced by newstainless steel bolts. All the plates were primed and painted. As it turned out, most of the original brick lining was re-used.Scott Brown, president of Friends of Sakonnet Lighthouse, wrote, "75 percent of the bricks used were salvaged from the original lay up. They are actually preferable to new brick as they have long ago reached their moisture saturation level and are perfectly stable. New brick will absorb moisture over time and create a jacking force much like rust." Most of the work was completed in late 2011. On December 11, a crew of nine men using a tug, barge, and crane cleared the rock of all the equipment used to restore the lighthouse. "It was a great success," said said Russ Burtt, project foreman. There are just a few finishing touches to be completed in 2012.